Zachary Harrison Wheeler (born May 30, 1990) is an American professional baseball pitcher for the New York Mets of Major League Baseball (MLB). He was drafted by the San Francisco Giants with the sixth overall pick in the 2009 MLB Draft. 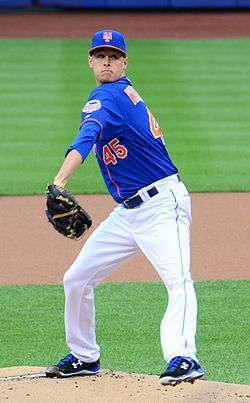 Wheeler was then traded to the Mets in 2011, and made his major league debut with the team on June 18, 2013. Prior to being drafted he attended East Paulding High School in Dallas, Georgia. Zack Wheeler was born to Barry, a longtime project coordinator for Georgia Power, and Elaine Wheeler in Smyrna, Georgia. Wheeler has two older brothers, Jacob and Adam. The Wheeler family was gifted athletically. Adam was selected by the New York Yankees in the 13th round of the 2001 Major League Baseball Draft and pitched in their farm system for four years before his career was derailed by injury. Barry also played in a men's baseball league while Elaine lettered in varsity basketball and softball during all four years of high school and continued to play softball competitively as an adult. Wheeler's brothers are both nearly ten years older than him and pushed him to excel in sports from a young age; at the age of two years, his brothers taught him to dribble a basketball, throw a baseball and switch-hit. Wheeler moved from Smyrna to Dallas, Georgia to attend East Paulding High School, where he played baseball and basketball. Wheeler was an unheralded ballplayer until he hit a growth spurt at 15 years old; his height eventually reached 6 feet 4 inches and his fastball exceeded 90 miles per hour, attracting the attention of scouts. In 2008, his junior year, he went 8–3 with a 1.31 ERA and 127 strikeouts over 64 1⁄3 innings and was named AAA Region Pitcher of the Year. In 2009, his senior year, Wheeler pitched in 13 games and finished 9–0 with a 0.54 ERA and 151 strikeouts in 77 2⁄3 innings. That year he was named the 2009 Gatorade High School Player of the Year for Georgia. Wheeler was drafted by the San Francisco Giants in the first round, sixth overall, in the 2009 Major League Baseball Draft. He signed with the Giants, foregoing a commitment to attend Chipola College. Wheeler pitched for the Augusta Greenjackets of the South Atlantic League, the Single-A affiliate of the San Francisco Giants. With the Greenjackets, Wheeler went 3–3 with a 3.99 ERA in 58 2⁄3 innings pitched. He also participated in the 2010 Futures Game in Anaheim, California, representing team USA. 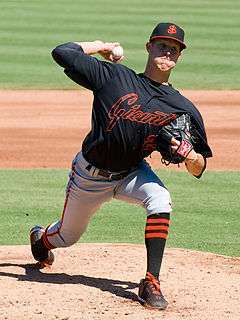 Wheeler began the season with the San Francisco Giants' Class A-Advanced affiliate, the San Jose Giants. He went 7–5 with 3.99 ERA, striking out 98 batters and walking 47 in 88 innings and was selected as a CAL Mid-Season All-Star. Then on July 11, he was traded to the New York Mets for outfielder Carlos Beltrán and cash. Wheeler was sent to the Mets Class A affiliate St. Lucie Mets, where he appeared in 6 starts going 2–2 with a 2.00 ERA through 27 innings. Wheeler with the Binghamton Mets at the Eastern League All-Star Game in 2012. Prior to the 2012 season, Baseball America considered Wheeler the Mets' best prospect and MLB.com listed him at 21st in professional baseball. He was promoted to the class Double-A Binghamton Mets. After beginning the season at 7–3 with a 2.29 ERA in 13 Double-A starts, he was named to appear in the 2012 Eastern League All-Star Game and in his second All-Star Futures Game. On July 14, Wheeler threw his first complete game shutout against the Erie SeaWolves. Although Wheeler pitched exceptionally, Mets manager Terry Collins said that Wheeler was not being considered for the big leagues at the moment. After this performance and vacancies in the Mets Triple-A affiliate's rotation, the Mets decided to promote Wheeler to the Buffalo Bisons on August 1. Due to a 150 inning limit set by Mets management, Wheeler's 2012 campaign ended on September 1. At Triple-A Wheeler started 6 games going 2–2 with a 3.27 ERA over 33 innings pitched. In that span he struck out 31 and surrendered 16 base on balls. Across Double-A and Triple-A for 2012 Wheeler went 12–8 with a 3.26 ERA and struck out 148, the most of any minor leaguer in the Mets organization. Going into the 2013 season, Wheeler was ranked 6th on the MLB.com Top 100 Prospects list and 4th on the RH Pitchers list. Wheeler spent the early part of 2013 season with the Las Vegas 51s. The Mets had Wheeler examined on May 15 regarding soreness around his right clavicle. Wheeler made his major league debut on June 18, 2013, in the second game of a day-night doubleheader against the Atlanta Braves at Turner Field, located less than an hour from where he grew up. Wheeler earned a 6–1 victory by pitching six scoreless innings, while allowing four hits, walking five and striking out seven. On August 15, Wheeler struck out a career high 12 batters while allowing one run on seven hits in six innings of work against the San Diego Padres. Wheeler finished his first season in the majors at 7–5 with a 3.42 ERA in 17 starts. Wheeler pitched his first career complete game shutout on June 19, taking a 1–0 victory against the Miami Marlins. Wheeler finished the season with a record of 11-11, 3.54 ERA in 32 games in 185.1 innings pitched with 187 strikeouts and a WHIP of 1.327 while giving up 167 hits, 84 runs (73 earned) 14 home runs, and 79 walks. On March 16, it was announced that Wheeler was diagnosed with a torn ulnar collateral ligament, and the prospect of Tommy John surgery was described as "likely." On March 25, Wheeler underwent successful Tommy John surgery to repair the torn UCL in his elbow and was ruled out for the entire 2015 year. The surgery was performed by Dr. David Altchek. Wheeler began the 2016 season on the 60-day disabled list in an effort to continue recovery from the previous year's Tommy John surgery. On August 6, he made a rehab start for the St. Lucie Mets but was only able to throw 17 pitches. On August 16th, he was diagnosed with a mild flexor strain in his right arm by Dr. James Andrews. An MRI showed that there was no damage to his ligament. Wheeler was shut down for two weeks putting his 2016 comeback in jeopardy. On September 3, the Mets announced that Wheeler would be shut down for the remainder of 2016 and would not resume rehabbing until spring training in 2017. Wheeler is a power pitcher with a 6 foot 4 inch (1.93 meter) frame that is lean and can generate great arm speed. He has a five-pitch repertoire that include a four-seam fastball, two-seam fastball, curveball, changeup, and slider. His fastball is consistently in the range of 95 to 100 mph and has great movement. Wheeler also has a 72–78 mph curveball that was rated the best in the Mets organization by Baseball America. Both his fastball and curve are considered to be plus pitches. Wheeler has also been developing a slider and a changeup. The slider is in the range of 88–91 mph and has been described to be more of a cut fastball. It is expected that with time this pitch will develop to have a sharper and longer break going from right to left of the strike zone. The change-up is in the 83–89 mph range and has some but not much movement and the offering is below average. 1 2 3 4 "Wheeler deals impressive major-league debut against the Braves" (PDF). Georgia Power. June 26, 2013. Retrieved 9 July 2015. 1 2 Marshall, Ashley (January 25, 2012). "Prospect Q&A: Wheeler dreaming big". Minor League Baseball. Retrieved 9 July 2015. 1 2 Borden, Sam (July 28, 2011). "A Name to Remember, if Also Misspell". New York Times. Retrieved 9 July 2015. ↑ "Adam Wheeler Minor League Statistics & History". Baseball-Reference. Sports Reference. Retrieved 9 July 2015. 1 2 3 Chris Haft (June 10, 2009). "Giants take focused pitcher in Draft". MLB.com. Retrieved July 19, 2012. ↑ "Zach Wheeler Stats, Bio, Photos, Highlights". MiLB.com. Retrieved July 19, 2012. ↑ Dustin Kent (June 19, 2009). "Corbin signs, Buchanan waits". Jackson County Floridan. Retrieved July 19, 2012. ↑ Eric Little (June 21, 2012). "Joseph, Wheeler Headed to Kansas City". MiLB.com. Retrieved July 19, 2012. 1 2 "Mets, Giants make Beltran deal official". mets.com. Retrieved July 19, 2012. ↑ "BaseballAmerica.com: Prospects: Rankings: Organization Top 10 Prospects: 2012 New York Mets Top 10 Prospects". baseballamerica.com. November 7, 2011. Retrieved March 16, 2015. ↑ "Wheeler picks up first Triple-A win". MiLB.com. Retrieved August 28, 2012. ↑ "Prospects pack rosters for Futures Game". Major League Baseball. Retrieved March 16, 2015. ↑ "Wheeler named Eastern League All-Star". ESPN.com. Retrieved March 16, 2015. ↑ Tim Heiman (July 14, 2012). "Wheeler Dazzles in Complete Game Shutout, 1–0". MiLB.com. Retrieved July 19, 2012. ↑ "TC praises Wheeler ... but says no way". ↑ "Source: Sunday eyed for Wheeler promotion". ESPNNewYork.com. Retrieved August 1, 2012. ↑ "Top prospect Wheeler moved up to Triple-A". MLB.com. Retrieved August 2, 2012. ↑ "Wheeler closes book on solid 2012 season". ESPN.com. Retrieved September 7, 2012. ↑ "Mets Prospect Zack Wheeler To Be Examined In N.Y. For Sore Clavicle". CBS News New York. Retrieved May 15, 2013. ↑ "Zack Wheeler likely to make major-league debut next weekend". Newsday. Retrieved March 16, 2015. ↑ "Zack Wheeler". ESPN.com. Retrieved March 16, 2015. ↑ "David Wright's homer all Mets need vs. Marlins in Zack Wheeler shutout". ESPN.com. Retrieved June 20, 2014. ↑ Gleeman, Aaron (March 16, 2015). "Zack Wheeler diagnosed with torn elbow ligament; Tommy John surgery "likely"". Hardball Talk. NBC Sports. Retrieved March 16, 2015. ↑ Hatch, Ryan (September 3, 2016). "Mets' Zack Wheeler done for season". NJ.com. Retrieved 3 September 2016. ↑ "Brooks Baseball · Home of the PitchFX Tool – Player Card: Zach Wheeler". Brooks Baseball. Retrieved October 1, 2012. 1 2 3 "Wheeler deals the hard stuff in preview". Newsday.com. Retrieved July 19, 2012. ↑ "Zach Wheeler, RHP, Mets". BaseballAmerica.com. Retrieved July 19, 2012. ↑ Adam Foster (May 23, 2011). "Zack Wheeler Scouting Report". Project Prospect. Retrieved July 19, 2012.